Twitter is making it easier for businesses to connect with their customers with the launch of a new tool called Twitter Dashboard. Twitter Dashboard enables users to create a custom feed to make it easier to see what is being said about their business. The custom feed automatically includes a user’s business name and mentions, but can be expanded to include more Tweets based on words and phrases that are connected to the business. Twitter suggests users add unique nicknames to their custom feed, as well as people or hashtags connected to their business. What’s more, users can add words and phrases that they don’t want in their custom feed. Once the feed is setup, users can engage with the tweets easily, including liking, replying and retweeting. 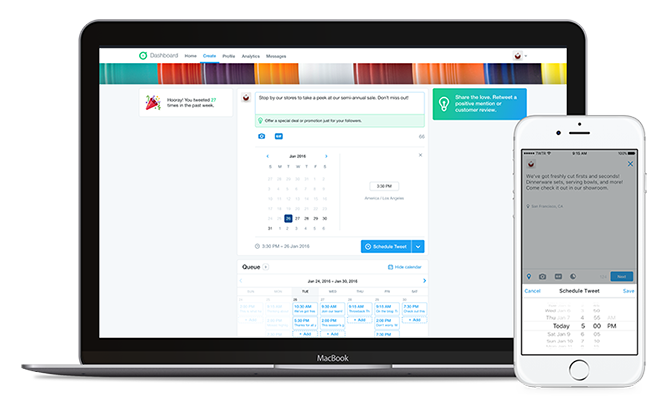 With Twitter Dashboard, users have the ability to schedule Tweets ahead of time. The scheduling tool is pretty straightforward, as the dashboard provides a calendar queue so users can look at all of their posts and add scheduled posts in advance. Plus, since Twitter Dashboard is available as an iOS app, user can also edit their scheduled tweets while on the go. In addition to the custom feed and scheduling features, Twitter Dashboard users will notice “tips” for businesses. These tips can be found in the “home” (custom feed) area as well as the “create” (scheduling) area of the dashboard. “For example, if you work at a restaurant, a tip like, 'Your team is as unique as your business. Tweet a surprising fact about one of your team members,’ might remind you to share some recent recognition your chef received,” Twitter said in its announcement. In addition to the cool features mentioned above, Twitter Dashboard provides users with analytics, including recent activity stats, audience mentions, follower updates, and data for profile visits and views. Plus, the tool enables users to access their profile and notifications, which makes it easy for businesses to manage and monitor their presence on the social network without needing to leave the dashboard. What do you think about Twitter Dashboard? Let us know in the Comment Section below.